Lava viewing is a must-do activity for your vacation if you are lucky enough to be on the Big Island while one of the volcanoes is actively erupting. Hawaii wouldn’t exist if it were not for the continuous volcanic activity that created all the islands in the state and seeing this happening in “real-time” is for many people a once in a lifetime experience. 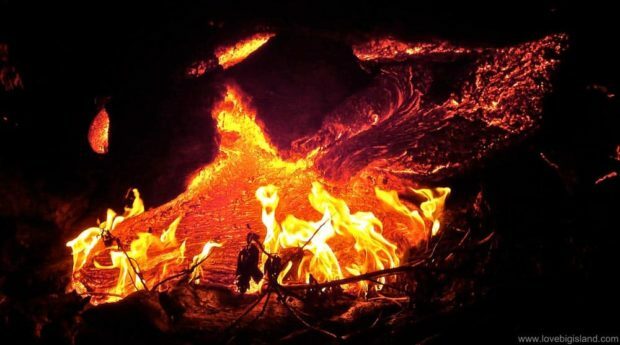 Seeing the lava up-close-and-personal is an experience that few people ever forget. How close you can get to the lava depends on where the flow is active, and what lava viewing locations are accessible. Access to the flow could be restricted e.g. if local conditions are unsafe. From up-close as it flows over the land and/or into the ocean. Conditions permitting your options are a  (guided) lava hike or  an ocean lava boat tour. From a distance, e.g. with a  a helicopter tour or from  a public viewing area. Hiking to the lava is the best way to get close as possible. However, sometimes lava hikes are not possible because there either is no lava flowing on the surface or access to the lava is too dangerous. If access to the flow is possible and on public land you will be able to find several companies that offer guided hikes to the lava flow during daytime or at night. Lava from the Kilauea volcano on it’s way to the ocean. If the conditions are safe during your visit, you can try to visit the lava yourself. 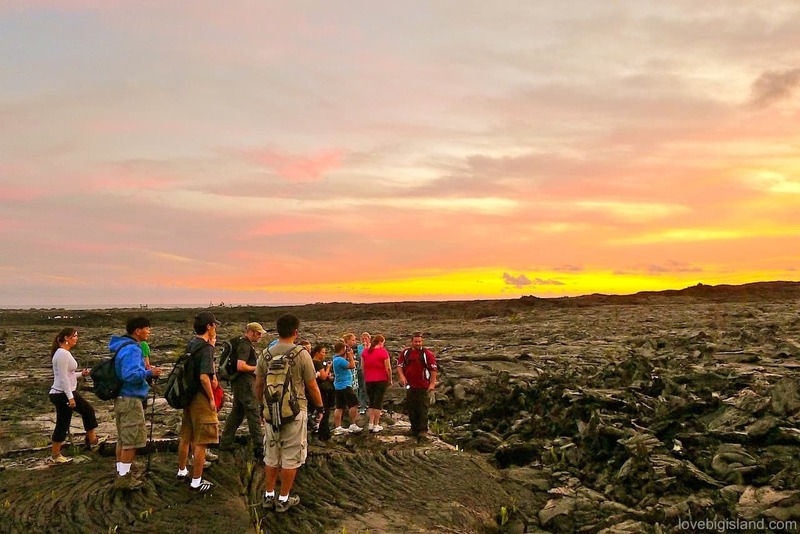 Hiking tours to the lava flow can be tiresome but are worth every drop of sweat you shed! Sometimes it is pretty straightforward to find your way to the lava yourself and it is good to remember that it is not mandatory to join a lava viewing tour to see the lava. If you do plan for a DIY adventure please make sure to educate yourself on the risks, to dress properly, and to bring plenty of water and sunscreen. A good place to start doing this is by checking out our lava hiking safety chapter. If the surface flows are within the national park boundaries (yay) and access is safe you can go on a hike to see the lava. Because viewing conditions can change on a daily basis you should look up the most recent information about the active surface flows shortly before you plan to see the lava yourself. The Hawaii Volcanoes National Park Visitor Center and the “what’s going on with the Volcano” web page of the Volcanoes National Park are good places to do so. If you want to see the lava while it is flowing on privately owned lands (nay) outside of the park boundaries there is a good chance you will be trespassing while hiking out. Make sure to get proper permission from the land owners before hiking up to those spots! By far the easiest way to see the lava in this case is to enlist a lava tour guide with proper permissions. This is one of our favorite videos to watch and get lost in the lava landscapes of the Kilauea volcano. Even after many dozens of repeats be keep being enchanted and mesmerized. Give the video quick look while you read more about lava in our guide! Guided lava tours should offer know-how, equipment (lights!) and access to restricted terrains when needed. The guides are trained professionals that know the terrain intimately. The added value of using a lava tour guide is of course safety, but also the extremely interesting background information they can provide about the eruption, and, of course, the peace of mind of a safe trek without getting lost. These tours can last between 1 hour and half a day depending on how far away the lava is. The hike almost always takes you over (very) uneven terrain so make sure to have an honest conversation with the guides beforehand to make sure you are physically able to complete the hike. A list of outfitters that organize hikes to the lava can be found on the price comparison website hawaiiactivities1. These hiking tours are sometimes combined with other activities so make sure to thoroughly read the descriptions. Booking a lava hike tour far in advance is risky because at the time of your visit the lava might have stopped flowing. We recommend to always read the cancellation conditions and, if they are strict, not to book these tours more than one or two weeks in advance. 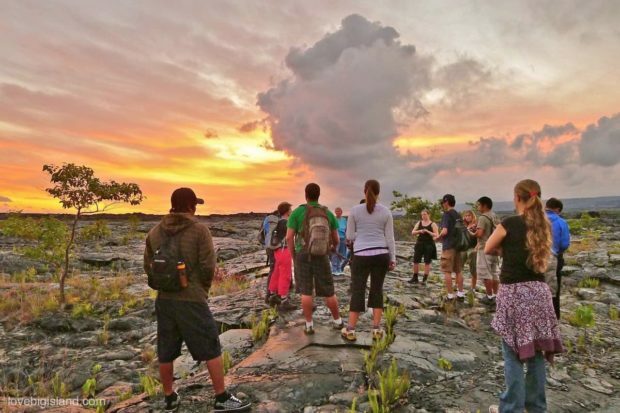 Another option for guided hikes where you can learn about volcanoes are tours that explore the Hawaii Volcanoes National Park. One such example is the “Volcano Unveiled” tour by Hawaii Forest & Trail. Is there no lava on the surface? There are other ways to learn about our Volcanoes! Consider taking a Volcano Tour to learn about the cultural and natural history of the volcanoes of Hawai’i. The Big Island is made completely by volcanic eruptions, and you don’t need to see red-hot lava to be amazed by all the remnants of creation of the Hawaiian islands! Guided tours can take you on the most interesting hikes in the park, show you private lava tubes, and take you to stunning places that are very difficult to find without a good guide. These guides are often also expertly trained and provide a wealth of volcano-related information. We list some very well-respected tour operators that offers these tours in our (new!) tour section. When the lava is flowing into the ocean you can also try to watch it from a boat. Going to the lava from the ocean side does not allow you to come as close to the lava as with the lava tours over land, but it will definitely offer you sights that are unique! Lava boat tours without limited entry approval from the US Coast Guard have to keep a distance of 300 meters (984 feet) from the ocean entry point outside the safety zone (source). Under special circumstances tour operators can get granted permission into the lava safety zone and approach closer. All four lava boat tour providers listed below have received such permission and will be able to take you in close. Lava enters the ocean at the Big Island during in 2017 during the 61g Kamokuna ocean entry while a lava boat gets close to the action. Note that the first 3 provider on the list above all use the same vessel (the “Ohana” with a 39 passenger capacity). All lava boat tours depart from the Wailoa Boat Harbor in Hilo, next to the Suisan Fish Market. Hilo is significantly further away from ocean entry point than the previous departure point (at Poihiki / Isaac Hale Beach Park) which means that the tours now take longer (typically 3 to 4 hours including ~30 minutes spent at the lava ocean entry site) and are more expensive (ballpark $250 / person) – similar in price to the cheapest helicopter tours. 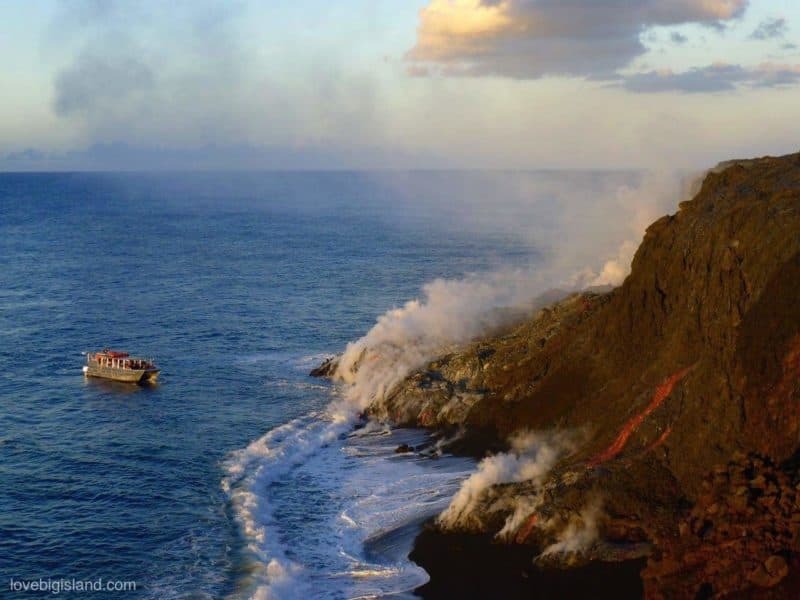 There are many possible risks when trying to see lava enter the ocean which we describe in our lava ocean safety guide and it is important that you choose your lava boat tour with care because of the many risks associated with seeing the lava this way. Make sure to always check if your tour operator is licensed to ensure that they possess the experience and training required to get you to the viewing area and back safely. According to the Hawaii Department of Land and Natural Resources (DNLR) the four tour companies we list above are the only tour companies permitted to offer the lava boat tour activity. Helicopter tours let you see the lava and volcanoes from the air. A helicopter can get you close to a lot of action that is not accessible over land or water and gives you an impressive birds-eye perspective. Think for example about a look into the crater lake, seeing surface lava flows from the air, or lava burning through forests. Helicopter tours are your best bet to see the lava when other ways such as a hike or boat tour are not possible because they can keep a safe distance while still offering an amazing perspective. If this is the case you should plan ahead because helicopter tours can fill up weeks in advance! Helicopter tours that take you to the lava depart from both Hilo and Kona. Tours from Hilo are shorter and thus cost less money. Still, helicopter tours are not cheap. So-called “Volcanoes and waterfalls” tours from Hilo start at a fee of $200 to $250 for ~45 minutes of flight time. Tours by Paradise Helicopters (external link) leave from both Hilo and Kona. See also our own guide to helicopter tours on the Big Island for an overview of all helicopter tour operators and tour options. Most of the time that lava is flowing on the surface it is possible to see it at a safe distance from a public viewing area. From these areas active lava can be visible directly or is accessible with a (short) hike. Public viewing opportunities change with time but some recent examples are the Kalapana viewing area (closed indefinitely) and the Jaggar museum overlook of the Halema’uma’u crater in the Hawaii Volcanoes National Park (currently closed). Update December 2018: the eruption activity has stalled and is very likely to be over. At the moment there is no public viewing area from which you can see the now paused eruption but plans for such an area are being talked about. 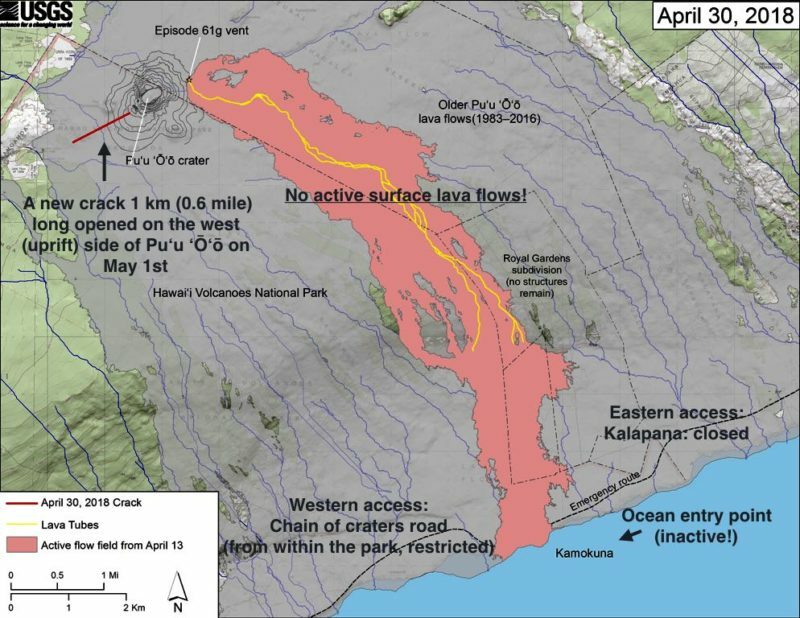 The County administration has plans to create a lava viewing platform and a short trail just past Lava Tree State Park near the “Y” where Highway 132 meets Pohoiki Road (source, see also the map below). From there, people will be able to see the vast expanse of fresh lava and the now inactive Fissure 8 cone. Kaleo’s for more upscale dining. There is talk of a public lava viewing area being planned at the Y intersection of Highway 132 with Pohoiki road (green circle). This is an excellent location to see the fissure 8 fountain and part of the lava river and as added bonus is close to Pahoa town, where you can have great lunch or dinner before or after lava viewing! Seeing the glow in the Halema’uma’u Crater (currently not possible). Lava viewing at the Halema’uma’u crater is currently not possible because the crater lake has drained and the crater has partially collapsed into the vent. It is unclear if (and when) the lava lake will return to the Kilauea summit. The most popular and accessible view of the crater is at the Jaggar museum and overlook (closed). If you are at the Jaggar museum and want to get away from the crowds you can also walk past the south end of the parking lot (away from the museum building and beyond the tour buses). This is a relatively new and less crowded viewing area just a few 100 ft from the Jaggar museum. You can also see the Halema’uma’u crater from the Kilauea overlook (more information), half a mile before the Jaggar museum. The Kilauea overlook is stop #3 on the crater rim drive drive tour, and is close to the highest point of the Kilauea Caldera. During daytime you can see an impressive plume coming from the crater but the view is truly breathtaking before sunrise and after sunset. During nighttime the glow of the lava lake colors the steam red, and if the skies are clear this blood-red plume is set in a sky full of stars. 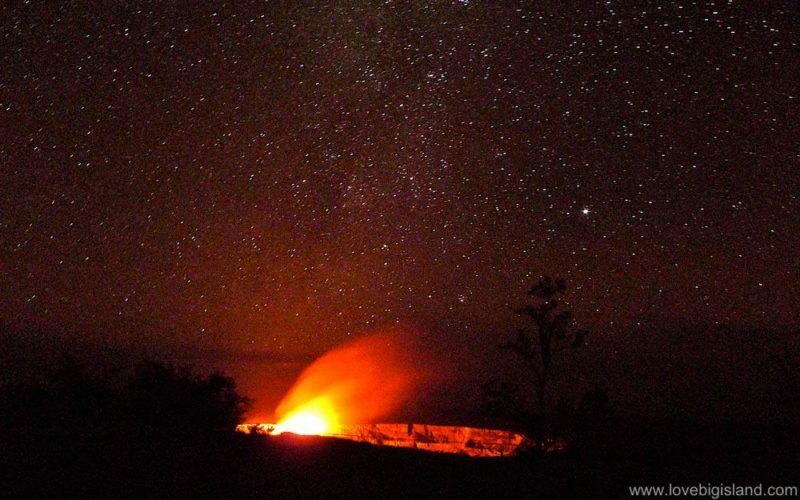 The glow from the Halema’uma’u crater at night in the Volcanoes National Park, seen from the Jaggar Museum overlook. The summit lava lake disappeared during the 2018 LERZ eruption. There is an element of chance involved in trying to see the lava like this. Because it rains frequently in the park the visibility is variable and can be very poor at times. If this is the case during your visit try spending 30 minutes inside the museum (very interesting and educational!) to see if the weather has cleared up, or return to the Jaggar museum later during your visit. There are five (!) 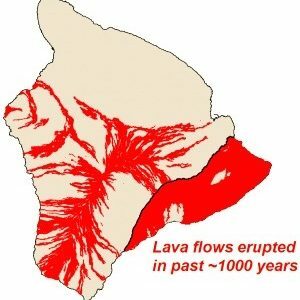 active volcanoes in the state of Hawai’i: four on the Big Island (Mauna Loa, Kilauea, Hualalai and, still under water but ever growing, Loihi) and one on Maui (Haleakalā). The Kilauea Volcano has been erupting continuously since 1983, which makes it one of the most active volcanoes in the world. Kilauea is the youngest and most active Volcano in the state of Hawaii. The oldest dated lava flows belonging to Kilauea are dated between 210,000 and 280,000 years ago which is pretty young for a volcano :D. Its eruptions over the last 1000 years have shaped the whole south east side of the island and covered about 90% of its surface. The last 100 years of volcanic activity can be divided in 7 eruptions. Click on the link in each episode to read an interesting summary on the USGS website. 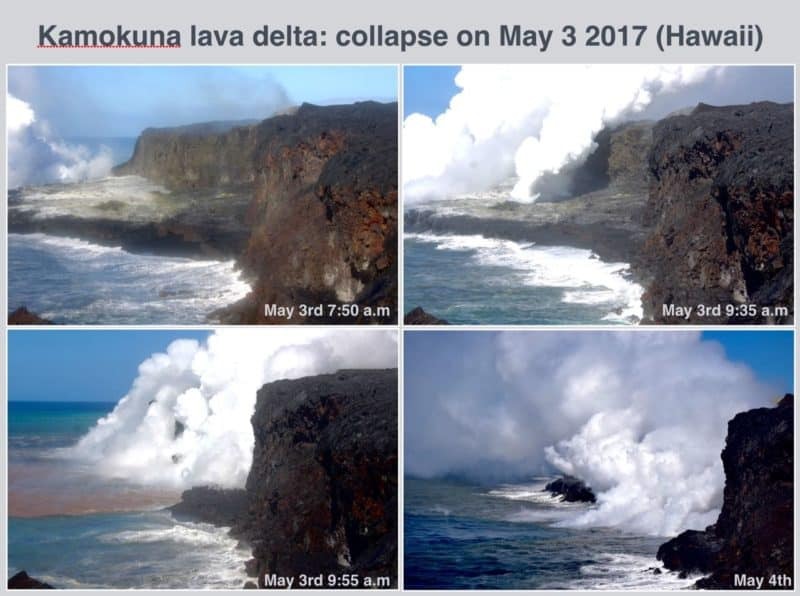 The Kīlauea Volcano lower East Rift Zone (LERZ) eruption in lower Puna was preceded by the collapse of the Puʻu ʻŌʻō vent on April 30th and the onset of the draining of the Halama’uma’u lava lake May 2nd. On the 3rd of may 2018 several fissures in the Leilani estates subdivision opened marking the start of this new eruptive episode: the Lower East Rift Zone eruption (LERZ, full chronology). 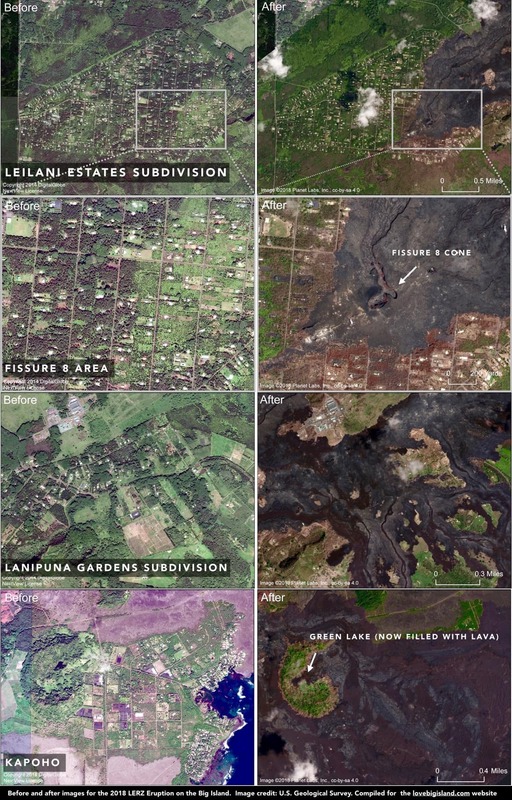 Before and after images of Leilani estates on the Big Island, which was severely impacted by the 2018 Lower East Zone Eruption. Credit for all images: U.S. Geological Survey. This is the newest episode of an eruption of the Kilauea volcano that has been on-going for almost 35 years. The fissures opened in the middle of the Leilani estates subdivision and have since wiped out over 700 houses. While devastating for the residents, the impact of this eruption is limited to a remote region on the east side of the Big Island, far away from the other Hawaiian Islands. No hiking to the lava flow is currently possible because the county has instated a no-go zone around the area affected by the lava to prevent looting of abandoned houses (enforced with multiple $1000 fines). October 2018 review of the Lower East Rift zone (Kīlauea) eruption on the Big Island, Hawaii. And, if you are not tired yet of all the videos, here is another one titled “100 Days : 2018 Kilauea Eruption” made by the local photographer Andrew Richard Hara. The video shows a compilation of his work made during the eruption. You can purchase his works through his website. The video is available in 4k and contains some AMAZING footage! The LERZ eruption lasted only about 3 months, but in that short period of time a LOT of things happened. Below you can read a chronology [source: USGS] of the events associated with the summit collapse the the LERZ eruption. 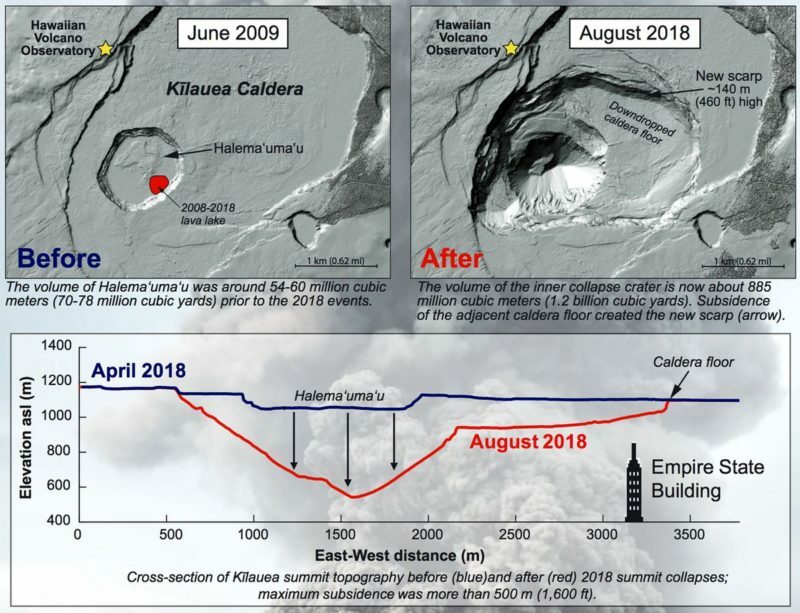 Below the chronology you can find a useful infographic showing just how much the Halema’uma’u summit has changed. May 4: Magnitude-6.9 earthquake on south flank of Kīlauea! Sept. 22: Hawaiʻi Volcanoes National Park partially reopens!! A breakout from the east flank of Pu‘u ‘Ō‘ō on May 24, 2016 marked the end of another fissure eruption on the flank of the Puʻu ʻŌʻō which started almost two years earlier on June 27, 2014. This was just in time for the inhabitants of Pahoa because the June 27th flow almost reached the city of Pahoa! This new breakout was later named the 61g flow (Episode 61, “g” lava flow). It reached the base of the Pulama pali by the end of June and entered the sea at Kamokuna on July 26, 2016. Between July 2016 and March 2018 it was possible to see the ocean entry of lava flow 61g close to Kamukuna both from land and from the sea. In March the up-to-then stable ocean-entry plume stopped being visible, and the Puʻu ʻŌʻō crater collapse on April 30th, 2018 marked the end of the 61g eruption. The 61g eruption was especially easy to see because the lava was slow-moving and accessible from both sides within the park. The presence of a nearby gravel road made the hike to the flow relatively easy and even allowed bike rentals to operate! This USGS map shows Kīlauea’s East Rift Zone lava flow field for April 30th, 2018. Access to the (mostly inactive) flow field was possible from both sides (Kalapana from the east or the chain of Craters road from the west) following the emergency road. There is a lot of information flowing around on the internet and not all of it is correct. Unfortunately quite some news outlets try to over-sensationalize the current events for their own profits, which leads to a lot of misinformation on the internet. 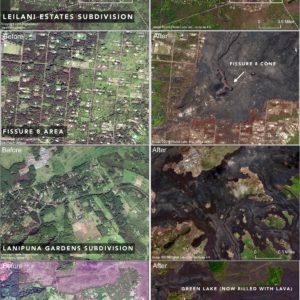 By the USGS: the daily Kilauea volcano lava flow update, the often updated USGS multimedia gallery, and an overview of information of the ongoing eruption. 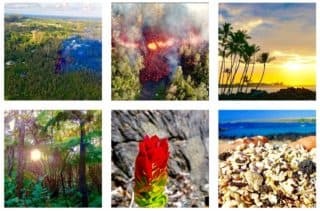 The /r/Bigisland/ page on Reddit for ongoing discussion on the newest developments. Probably the best place to see spectacular images of the eruption is on Instagram (#fissure8). The Hawaii County Civil Defense Alerts. Volcanic fumes are hazardous to your health. Persons at risk of respiratory problems or with heart problems, pregnant women, infants, and elderly people, are all discouraged from engaging in this activity. Getting close to the lava flow is both spectacular and risky and it is very important to realize that hiking out to the lava unprepared can put you in harm’s way. 1: Hiking to the lava: stay out of closed areas and be prepared! We recommended that you wear comfortable socks and walking shoes or hiking boots when hiking out. Pack sunscreen and water together with your camera. If you plan to view the lava flow after dusk, remember to bring one flashlight per person. The Kilauea is a dynamic volcano, and lava viewing conditions change daily. Even if a viewing area is organized by the National Park, this does not guarantee close access of the lava. Often a 1+ hour hike over hazardous terrain is necessary to reach the flow front of the lava. We can’t overemphasize being prepared for the hike. Far too many times, ill-prepared people (most often tourists) go on a lava hike wearing sandals and flip flops. Such footwear is not appropriate or safe for the rough lava surfaces, and wearing them may force you to return home prematurely without having seen the lava. If you plan on staying past sunset (and we highly recommend this), each person should carry their own flashlight for the walk back (see “Guided lava tours“). The noxious gasses that are released when the lava meets the ocean. Newly created land is inherently unstable and much of the new land will collapse back into the ocean after a while. Park rangers keep a close eye on the stability of the lava bench and limit the lava viewing area based on what they judge to be safe. This safe distance is based on visual inspection and thermal imaging and is was set, for example, at 1/2 mile or 820 meters for the now now inactive Kamokuna episode (see image below). Collapses like this may even trigger small tsunamis of scathingly hot water. Please follow any instructions given by park rangers regarding a safe viewing distance. It is very important to stay away from the plume when you are watching the lava enter the ocean. In general the wind carries this noxious ocean entry plume offshore and out to sea during nighttime and early mornings. From mid-morning through late afternoon the wind sometimes carries the plume onshore and along the coast. The white plume is very hot and contains next to super heated steam many chemical products that range from unhealthy to possibly lethal. The water droplets in the plume can be as corrosive as battery acid and in addition the air can contain a host of possibly lethal gasses. Read more about the dangers of scalding water, steam plumes and bad air on the USGS website. Contrary to what many may expect expectations the Big Island has a lot of problems with air pollution. This air pollution is not man (or car)-made but comes straight out of the volcano. This volcanic pollution is called ‘vog’. Vog, a blend of the words “smog”, “fog” and “volcanic”, is so normal here that it is part of the common language on the Hawaiian Islands. Vog is a form of hazy air pollution much like smog. It is created when sulfur dioxide gas emitted by the Kilauea volcano reacts with oxygen and moisture in the presence of sunlight. Just like smog, there are certain health hazards associated with vog. You can find voggy conditions in the downwind direction of all eruptive sites. Because the dominant wind directions are east and north-east, the areas most affected by fog are those south and southwest of these sites. The USGS has teamed up with IVHHN/Durham university and HDOH to form the Interagency Vog Dashboard where you can find specific vog advice for visitors to Hawai’i. The EPA also maintains an air quality monitor for the Big Island here.